If you didn’t know the New York Film Festival has started. It began Friday with lots of free events and last night with the big premiere of THE WALK. I’m hip deep in the hoopla running to all sorts of screenings. I know the coverage here at Unseen has been a little weird with mostly coverage of the shorts and the Projections series taking center stage before the features kicked in yesterday. I'm sorry about that. I know in the past we’ve given you reviews of early features and the revival screenings before the festival started, but this year they’ve kind of cut back on the revivals. As for the early features, we’ve seen a few and the reviews are slotted, but the truth of the matter is that this year we’re seeing a good number of the films at public screenings so the reviews are coming a little later. While I know we are going to have a little less coverage, number wise, than in years past we are going to actually nail most of the films that seem to be the important films. As for the ones we miss, we’ll catch them down the road. I’m also talking to a good friend (Liz) of Unseen who is seeing everything and she is steering me as to what I should catch and when. Actually outside of the Convergence sidebar we're on track to get you a high percentage of everything. The point of this is keep reading because lots of reviews are coming between now and the 11th. As many of you know my great friend Lou died a couple months back. I knew Lou for about 30 yers before he died. Every year we'd talk the New York Film Festival choices and ponder when we'd get to see them. Lou was the guy who first got me to the festival to see Peter Greenaway. Over the last few years I'd take him to see one film or the other. 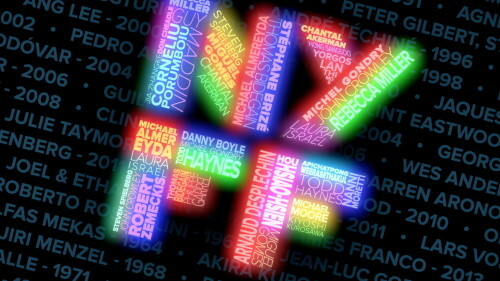 I can not think of NYFF without Lou....and so it was that today I went to my first NYFF without him. To say it was a weird day is putting it mildly. The day began with seeing Marcel Ophuls introduce his sequel to the SORROW AND THE PITY. Lou was much in my mind since SORROW is reference in a gag in ANNIE HALL that Lou and I would riff on endlessly. And then I saw MIA MADRE which has a graying John Turturro looking like Lou, and being just as crazy- Turturro's third act dance had me tearing up as I laughed since many of the moves could have been Lou's in a silly mood. Lou you are missed my friend- its not the same without you.